Upcoming Events – Dewey’s Comic City Signing! – Fernando Ruiz Everybody! The 2018 DIE KITTY DIE HEAVEN & HELL World Tour continues! My next stop is one I’m very much looking forward to. Saturday May 12th I’ll be appearing at the great Dewey’s Comic City in beautiful Madison, New Jersey to sign comic books and draw FREE sketches! For twenty years, I had a long, uninterrupted streak of Free Comic Book Day appearances at Dewey’s. This year, I had to break that run due to a conflict in scheduling. It really broke my heart as I truly love Dewey’s and have nothing but tremendous affection and respect for the original Dewey’s owner, Dan Veltre, as well as current Dewey’s owner, my protege, the talented Anthony Marques! Fortunately, this Saturday, I can make up for my absence on Free Comic Book Day. 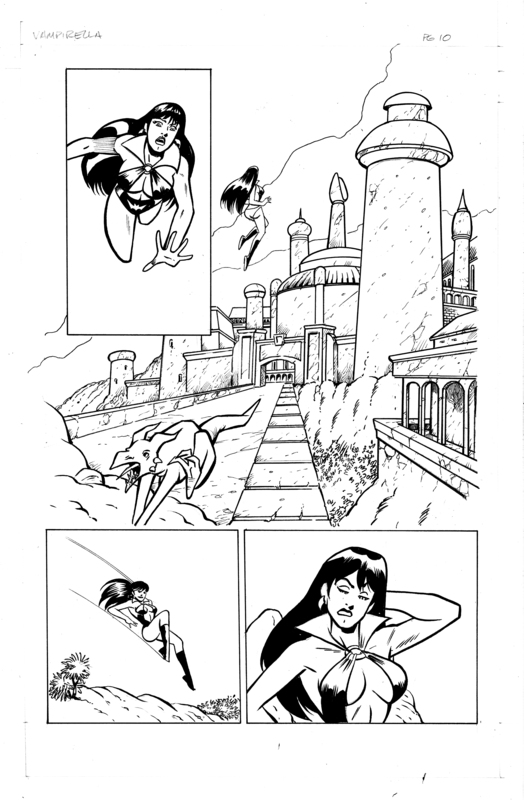 Not only will this event be a sort of compensation for my FCBD absence, but it is also in celebration of the new comic book, Savage Tales: Vampirella, released just this past week and published by Dynamite. This book is significant because it features artwork by both Anthony Marques and myself. Note that my contribution is five pages pencilled and two inked. You can check out a couple of those pages below. Make sure you grab a copy and bring it by on Saturday to Dewey’s. Anthony and I will be thrilled to sign it for you. Another guest of this mini-sequal to last week’s Free Comic Book Day is the ultra-talented Charles Wilson III, artist of the mega-hit comic book, The Stuff Of Legends! Make sure you come by and see Charles too! I understand Anthony has run out of copies of the Die Kitty Die “I love You To Death” Free Comic Book Day Special. Not to worry! I’ll be bringing a few extra copies for everyone to grab. Come on by and get yours! !